In 1979 I heard those dreaded words, “You have cancer.” I had no knowledge about cancer- didn’t know anyone who had cancer. In those days no one talked about it. “C” was a death sentence. My husband and I searched for information and decided on an unusual treatment for breast cancer in those days. I had a lumpectomy and radiation. The treatment was successful for me and I was able to continue to live a normal life for 15 years. At my annual mammogram in that 15th year, the doctors discovered a new cancer in the same breast. After a successful treatment I decided God wanted me to share my experience with others who are facing cancer. I volunteered for the American Cancer Society’s Reach to Recovery Program. Meeting newly diagnosed breast cancer patients, listening to their fears, sharing my story, giving them hope that they could live a normal life again after cancer has been a very satisfying experience for me over the past 18 years. I feel blessed to have had cancer. It has opened my eyes to appreciate each day that God gives, to the many beautiful friends I have made over years who have courageously fought cancer, not just breast cancer. As a survivor I was invited to attend the Relay For Life and was so honored to see how much the American Cancer Society (ACS) does for cancer patients. I decided I wanted to help ACS raise money to help fund research for a cause, to provide new treatments for cancer patients, and to help educate the public about what was available in the way of prevention and detection programs. In 2006 I was invited to go to Washington, DC to a Celebration on the Hill where survivors and other citizens told their stories to congressional leaders and requested that the government fund the National Institute for Health and the Center for Disease Control. Both of these agencies are the largest fund raisers for research and programs to help cancer patients. Over the last 7 years I have become acquainted with both state and national congressman and have lobbied for them to make the fight against cancer a priority. I was pleased to learn that our congressional leaders really value our opinions on these issues and really do listen to us. The American Cancer Society is the non-profit organization that raises the largest amount of money for the fight against all cancers. Last May I decided I wanted to reach out to more cancer patients, so I volunteer at the Cancer Resource Center at Exempla Lutheran Medical Center. I help patients find books from the lending library, fit patients with donated wigs, hats and scarves, and visit with patients who are getting chemo and other infusion drugs. I highly recommend sharing your time with these wonderful people. Many are in pain and struggling so much, but they have such a great outlook on life and appreciate a kind word from the volunteers. Contact the hospital to volunteer. 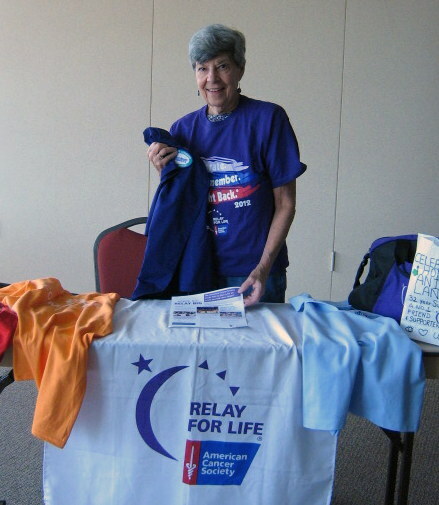 Join Relay For Life or attend Relay. Purchase fund raisers, like heart pins, daffodils, luminaries or doves to be released, or make a donation to one of our team members. Join The Cancer Action Network and help us lobby Congress for cancer patients, by letter, email, or phone. Drive cancer patients for treatment through the ACS program. Knit or crochet chemo hats for patients.